I decided to make a convenient billboard action so that you can have gameObjects in your world always facing the camera, it's very useful for trees, or UI elements, etc etc. There is an option to keep constant screensize. 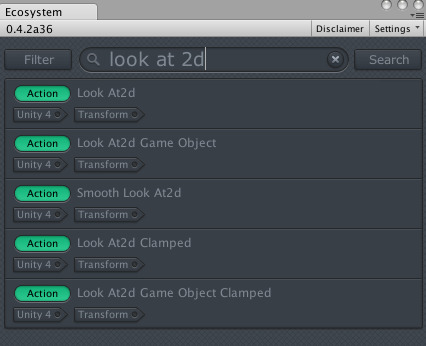 this works best with flat mesh for UI. [EDIT] Added the option to define the distance at which the object should be scaled to 1. Thanks Jean! I hope it will be added to release someday (and many other of your actions too). I think it would be great to add to this action a constant size, but not based on initial scale and distance but rather somehow with constant and shared size on screen. I don't know if <distance on which object is scaled to 1.0> is clear enough for users. Scale in relation to screen size would better but I'm not sure how to approach this since it's 3d object. Can you bump this next week? I'll see what I can do. Any ideas on why i get this error? Also i get the same error when the action is imported via the ecosystem or manually. It's because you don't have a Camera tagged "MainCamera". You should always have one tho. I have updated the action on the Ecosystem, redownload it and it will now work. Hey guys i see this is old, but... Jean is it possible to modify the action to lock one axis and for example rotate the billboard only on X and Z around an Y pole stuck in the ground? I found this script and it works... can it be implemented/converted to an action? I think it's covered already with the "look at 2d" types of actions you'll find on the Ecosystem. let me know if you can't find anything suitable. Yay, thanks Jean, will check it out asap!